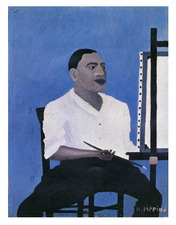 “Horace Pippin: The Way I See It,” a major exhibition of more than 65 paintings assembled from museums and private collections across the United States, opens on April 25 at the Brandywine River Museum of Art in Chadds Ford. One of the leading figures of 20th-century art, Horace Pippin (1888-1946) is known for his bold, colorful and expressive paintings of family life, history, religion and war. This will be the only venue for this exhibition. Pippin was born in West Chester, less than 10 miles from the Brandywine, but grew up in Goshen, N.Y. He eventually returned to West Chester in 1920, after serving in World War I as part of the renowned African-American regiment known as the "Harlem Hellfighters." Despite a war injury that severely limited the use of his right arm, Pippin created an illustrated journal of his war experience on his return home, and by 1930 had begun teaching himself to paint in oil, using his left arm as a support for his right hand. Pippin painted in relative obscurity during most of the 1930s.Though his work was known to his neighbors and sometimes displayed in local businesses, it was not until 1937 that his paintings gained wider public recognition when he exhibited two works at the Chester County Art Association's annual exhibition. Awarded a special mention by N.C. Wyeth, who was judging the show and helped ensure that Pippin's paintings were shown prominently, Pippin immediately garnered local press attention. Wyeth also persuaded the art critic and collector Christian Brinton to arrange for Pippin to have a solo exhibition at the West Chester Community Center, where the artist showed ten oils and seven burnt-wood panels. Pippin was quickly embraced nationally by museums, galleries, critics and collectors who valued the self-taught artist's style, characterized in his time as "primitive" or "naïve" for its perceived pureness of expression. Patrons ranged from Albert Barnes and Edith Halpert to Hollywood figures such as Charles Laughton and Edward G. Robinson. Among the works in the exhibition is “The End of the War: Starting Home” (1930-33), a seminal work representing the horrors of a war that Pippin would later say "brought out all the art in me." A muted palette with bursts of red evokes the sense of desolation amidst the chaos of battle. It is Pippin's first known oil painting, demonstrating his early method of building layer upon layer of pigment in an almost sculptural manner. Pippin was an astute observer and well-informed about the subjects he undertook – especially history. He completed two major series with historical themes, one on the life of the abolitionist John Brown, and the other on Abraham Lincoln. “John Brown Going to His Hanging” (1942) is one of Pippin's most visually and emotionally engaging paintings. Brown is portrayed at the center, sitting atop his coffin while being driven to the gallows. While the crowd looks on, a figure to the far right stares out from the painting, representing Pippin's mother, who was said to have witnessed the event. Pippin's art is highly personal, and he often drew upon his own life as subject matter. In “Interior” (1944), a family is together in the same room, yet each member seems lost in their own world. Pippin juxtaposes bold outlines, brilliant passages of color and nuanced texture and pattern in this candid portrayal of family life. He also created several paintings that depicted everyday life in West Chester. A particularly captivating example is “Harmonizing” (1944), which portrays an a cappella quartet singing on a street corner. Within this townscape, Pippin focuses attention on the singers by contrasting them and their brilliantly colored clothing against the stark pattern of the fence, over which a church steeple seems to survey the scene. Religious themes also held particular significance for Pippin. Among the most compelling is the theme of the Holy Mountain, on which he created four paintings from 1944 through 1946. Inspired in part by Edward Hicks's “Peaceable Kingdom” series, Pippin focused on the Old Testament text by Isaiah that told of God's founding of his city on the Holy Mountain. Pippin's interpretation, however, goes beyond the biblical into a reflection on the nature of war, peace and racial injustice, with Pippin tying the biblical passage to historical and contemporary events. “Horace Pippin: The Way I See It” will be accompanied by a fully illustrated catalogue featuring essays by exhibition curator Audrey Lewis, and guest authors Judith Dolkart, Jacqueline Francis, Kerry James Marshall, Anne Monahan, and Edward Puchner. It will be available in the museum shop and online at brandywine.org. The Brandywine River Museum of Art (Route 1, Chadds Ford) is open daily from 9:30 a.m. to 4:30 p.m. Admission is $15 for adults; $10 for seniors; $6 for students and children ages 6 to 12; free for children age 5 and younger, and Brandywine Conservancy & Museum of Art members. Admission is free on Sundays from 9:30 a.m. to noon (except on May 24, during the annual Antiques Show).